Showing items in category Indian Feudatory States, sorted by newest listed first. 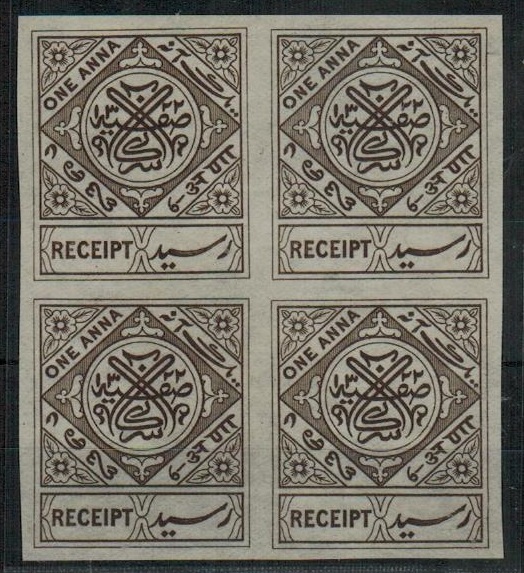 INDIA (Hyderabad) - 1930 (circa) 1a brown RECEIPT stamp in a fine mint unused block of four. 1930 (circa) 1a brown RECEIPT stamp in a fine unused (as issued) block of four. 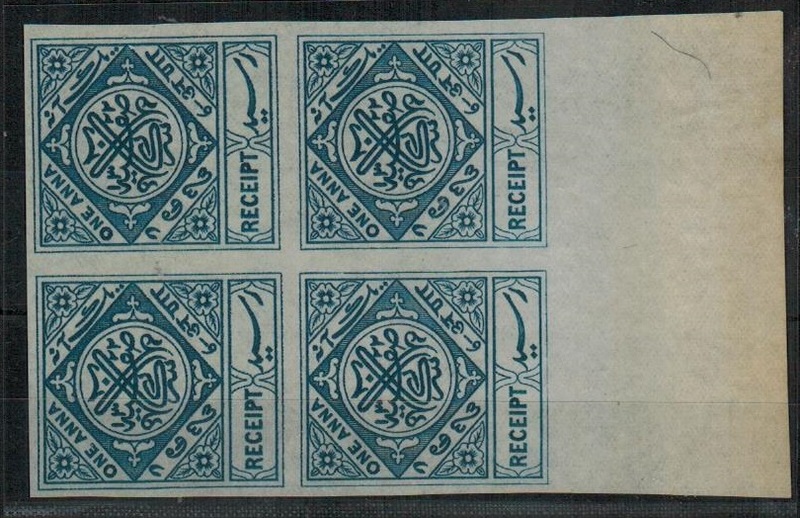 INDIA (Hyderabad) - 1930 (circa) 1a blue RECEIPT stamp in a fine unused mint block of four. 1930 (circa) 1a blue RECEIPT stamp in a fine unused (as issued) block of four. 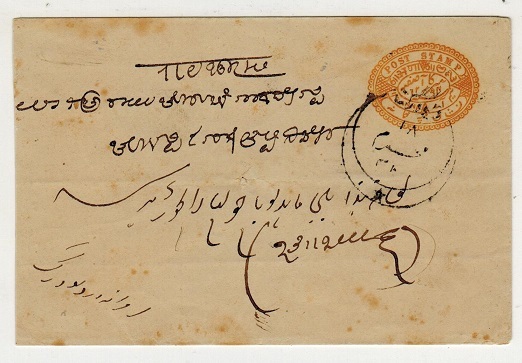 INDIAN FEUDATORY STATES (Soruth) - 1868 (circa) 1a local cover used at JUNAGADH. 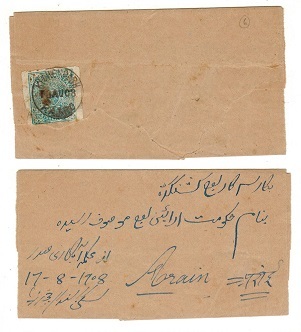 1868 (circa) use of pre printed cover addressed to the Chief Justice at Junagadh bearing 1a black on azure (type 4-Devanagri numeral) imperforate adhesive tied bu barred squared cancel. 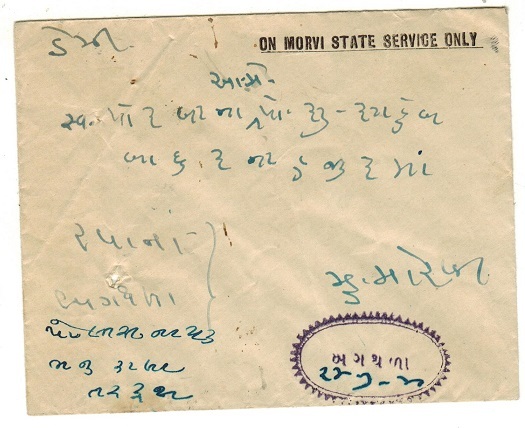 Headed 'Posted in Junagadh Post Office' and with oval Indian script arrival b/s. Unlised in this type by SG. 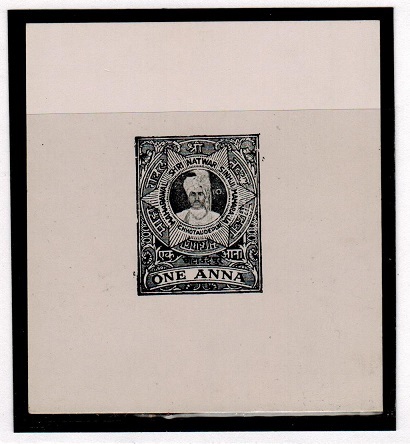 INDIA (Cochin) - 1917 4 1/4a rate 'ON/C.G.S.' cover used locally at TRICHUR. 1917 (26..DHA.) registered cover addressed locally bearing 2a black and 2 1/4a yellow green adhesives overprinted ON./C.G/S. for official usage and cancelled by TRICHUR d/r cds. COCHIN/ANCHAL advice of delivery slip still attached to reverse side. INDIA (Jaipur) - 1943 3/4a orange PSE used locally at SURAJGARH. H&G 8. 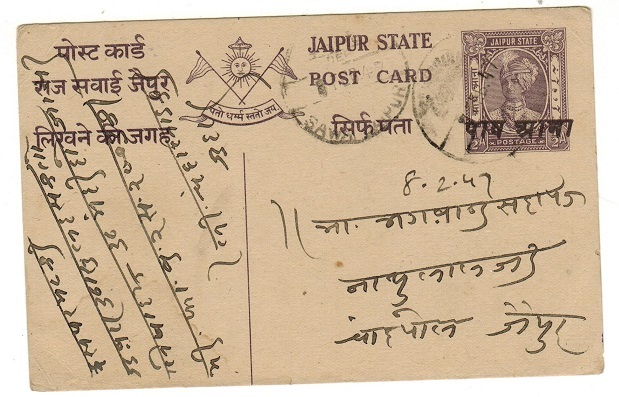 1943 3/4a orange on buff postal stationery envelope addressed locally and cancelled by SURAJGARH cds dated 27.FEB.47. H&G 8. 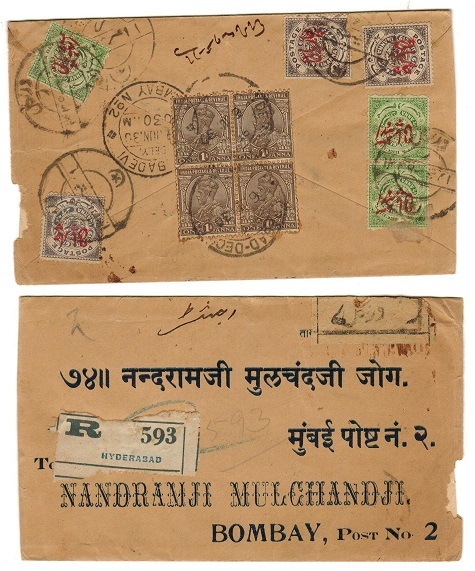 INDIA (Hyderabad) - 1937 'India/States' combination cover used at NANDED HYDERABAD DECCAN. 1937 (FE.3.) 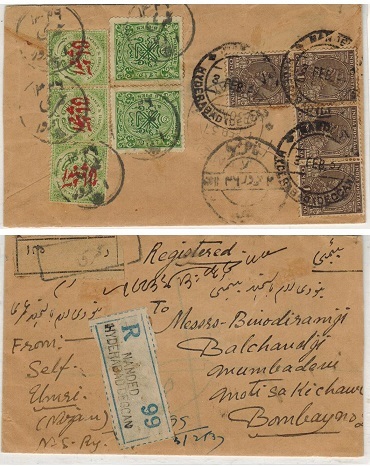 registered cover addressed to Bombay bearing 'GV' 1a brown (x4) cancelled by NANDED HYDERABAD DECCAN cds's tied in combination with Hyderabad 8p red on 1/2a green (x3) and 8p green (x2) adhesives (SG 40+42) by native script cancels. 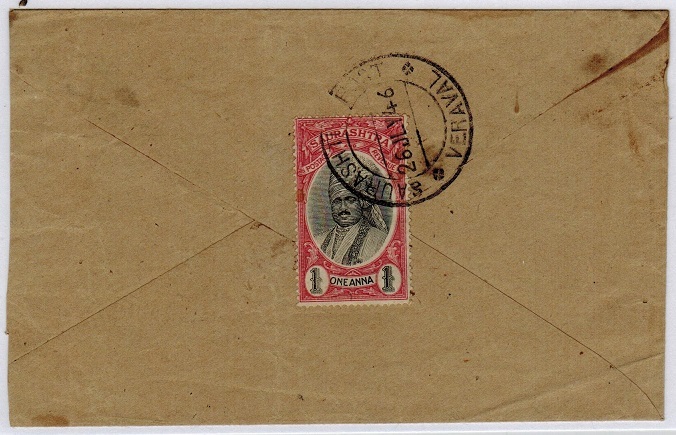 INDIA (Hyderabad) - 1920 (circa) 1/2a rate use on OHMS cover used at KHARATABAD. 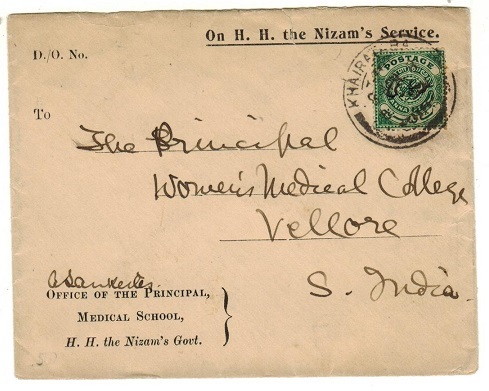 1920 (circa) ON H.H.THE NIZAMS SERVICE cover addressed to India for use by the Medical School bearing the 1/2a green adhesive overprinted for official use SG 040) and cancelled by d/r KHARATABAD cds. INDIA (Hyderabad) - 1949 3a rate 'ALL INDIA EXHIBITION' cachet cover used locally. 1949 cover addressed locally to Secunderabad bearing 3a bluish green 'Power House' adhesive (SG 56a) tied by local script cancel and struck on the reverse side by scarce black boxed FIRST TIME IN HYDERABAD/ALL INDIA EXHIBITION/DECEMBER 10th 1949 to JANUARY 10th 1950/BEST OPPORTUNITY FOR BUSINESS cachet. INDIA (Dhar) - 1897 1/4a PSC in two different shades. Unused. H&G 5. 1897 1/4a postal stationery postcards in fine unused condition on yellow back but each in marked different colours. On bright purple the other dull violet. H&G 5. 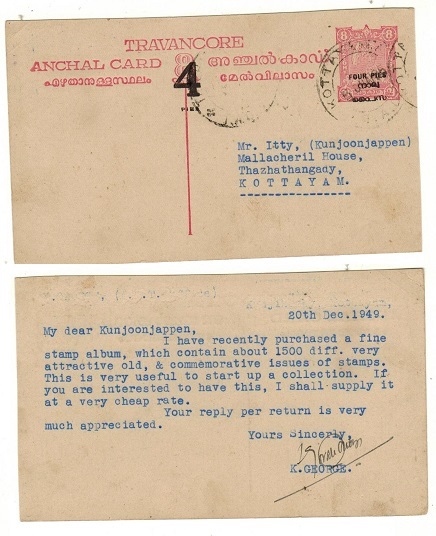 INDIA (Travancore) - 1935 1a red PSE unused. H&G 23. 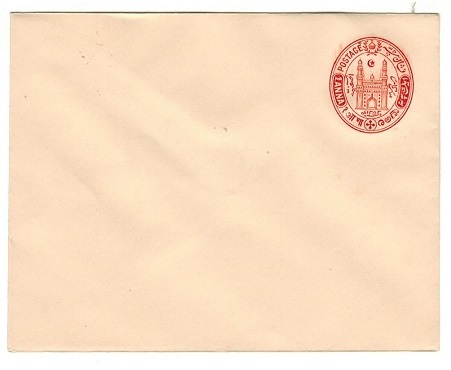 1935 1a red 'Mosque' on white postal stationery envelope in fine unused condition. Flap part stuck down. H&G 23. 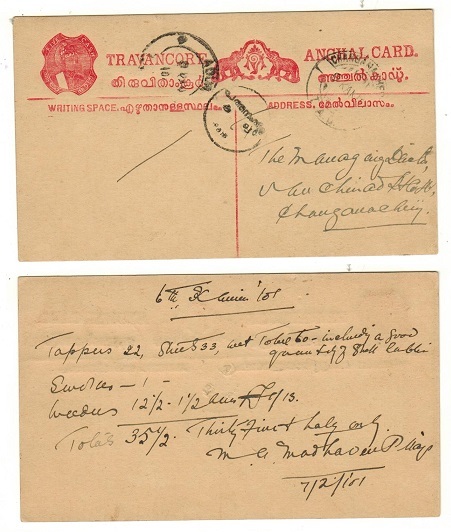 INDIA (Travancore) - 1913 3/4c orange red PSE used at KANOIRAPPALLY. H&G 7. 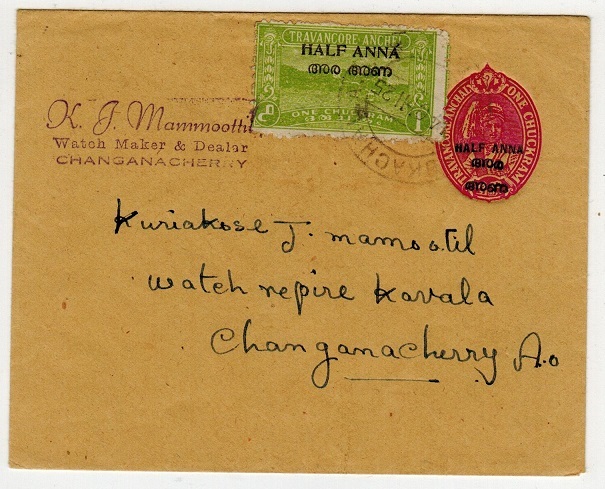 1913 3/4 cash orange-red on buff postal stationery envelope addressed locally in script and cancelled by KANOIRAPPALLY A.O./T.AS.D. cds dated 16.KAN.115. H&G 7. INDIA (Travancore) - 1915 4c rose PSC used at CHANGANACHERY. H&G 20. 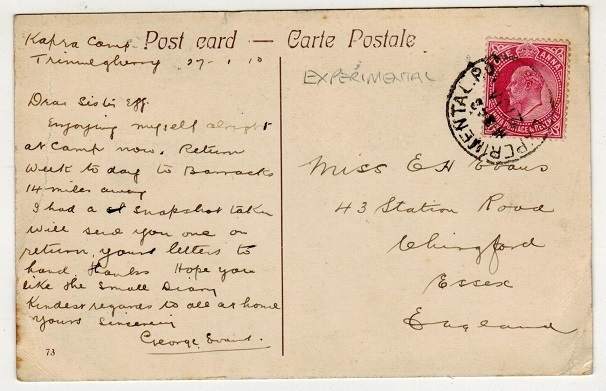 1915 4c rose on cream postal stationery postcard addressed locally and cancelled by CHANGANACHERY cds dated 9.KAN.01. H&G 20. INDIA (Travancore) - 1925 5c purple PSC used at ADOORA A.O./TAD. H&G 23. 1925 5c purple on buff postal stationery 'conch shell' postal stationery postcard addressed locally and cancelled by script cds with ADOORA. A.O./T.A.D. cds alongside dated 18.THU.105. H&G 23. INDIA (Travancore) - 1932 6c rose red PSC used at KONNY A.O. H&G 24. 1932 6c rose red on buff 'conch shell' postal stationery postcard pre-printed locally for use by 'Daily Report of Chemmai Estate' cancelled by KONYY A.O. cds dated 25.MAV.118. H&G 24. INDIA (Travancore) - 1940 (circa) 6c dark green 'ON SERVICE' PSC used at MANNAR A.O./TAD. 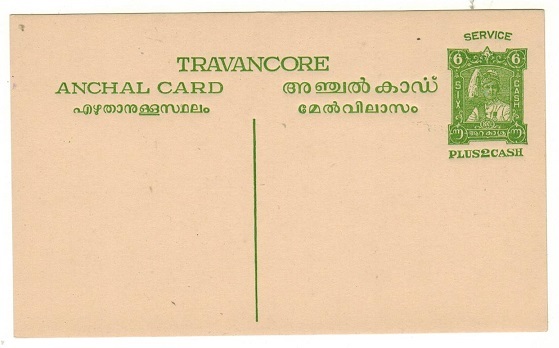 1940 (circa) 6 cash dark green on buff 'conch shell' postal stationery postcard headed 'Trancore Service Anchal Card' with ON SERVICE above addressed locally and cancelled by MANNAR A.O./T.A.D. cds dated 17.MIT. 115. Unlisted by H&G. INDIA (Travancore) - 1941 6c bright purple PSC used at KONNY A.O./TAD. H&G 25. 1941 6 cash bright purple on cream postal stationery postcard pre-printed for use by 'Daily Report From Chemmai Estate' and cancelled by KONNY A.O./T.A.D. cds dated 31.MED.18. H&G 25. INDIA (Travancore ) - 1943 (circa) 6a yellow green 'SERVICE' PSC unused. H&G 13. 1942 (circa) 6c yellow green on cream postal stationery postcard with 'Plus 2 Cash' below and SERVICE above in arch in fine unused condition. A scarce service card. H&G 13. 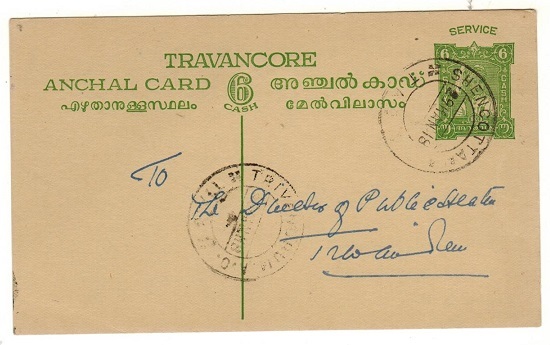 INDIA (Travancore) - 1942 (circa) 6c yellow green 'SERVICE' PSC used at SHENCOTTAH. H&G 13. 1942 (circa) 6c yellow green on cream postal stationery postcard with 'Plus 2 Cash' below and SERVICE above in arch addressed locally and cancelled by SHENCOTTAH cds dated 29.KAN.18. A scarce used service card. H&G 13. INDIA (Travancore) - 1949 4p on 8c carmine PSC used at KOTTAYAM. H&G 2. 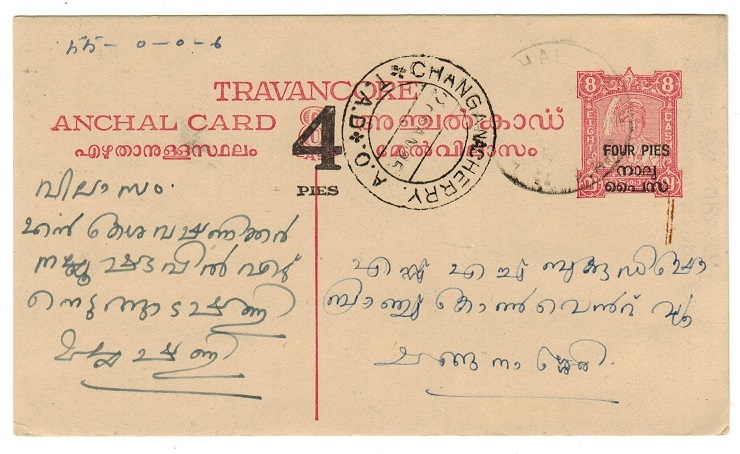 1949 4p black on 8c carmine on cream postal stationery postcard addressed locally and cancelled by KOTTAYAM cds. H&G 2. 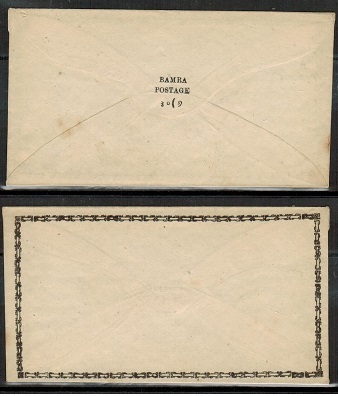 INDIA (Bamra) - 1889 1/2a black 'BAMRA POSTAGE' postal stationery envelope unused. H&G 2. 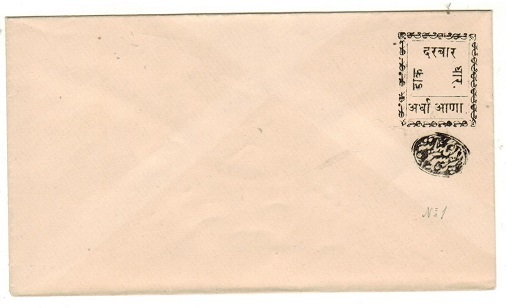 1889 1/2a black 'BAMRA POSTAGE' postal stationery envelope in fine unused condition with scroll border. The value being printed on reverse flap. H&G 2. INDIA (Dhar) - 1898 1/2a blue on cream PSE unused. H&G 2. 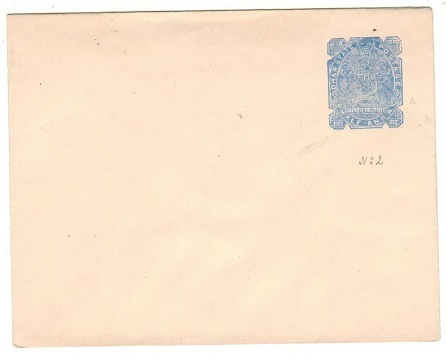 1898 1/2a blue on cream postal stationery envelope in fine unused condition. H&G 2. INDIA (Dhar) -1897 1/2a black on cream PSE unused. H&G 1a. 1897 1/2a black on cream postal stationery envelope in fine unused condition with curved gum flap on reverse (47mm deep) and black control. H&G 1a. 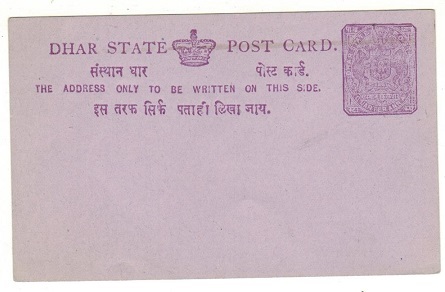 INDIA (Dhar) - 1897 1/4a dark violet on light violet (yellow back) PSC unused. H&G 5. 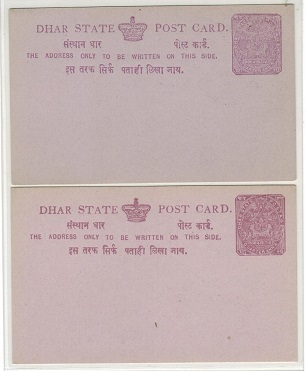 INDIA (Dhar) -1897 1/4a deep violet on cream PSC unused. H&G 1. 1897 1/4a deep violet on cream postal stationery postcard in fine unused condition with black control mark applied below. H&G 1. INDIA (Morvi State) - 1935 3p vermilion PSC used locally. H&G 5. 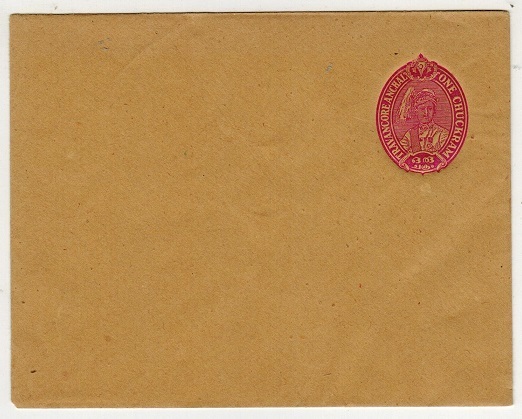 1935 3p vermilion on cream postal stationery postcard (spiked) addressed in local script and cancelled by violet oval cancel having the date '20-2-35' inserted in manuscript. H&G 5. 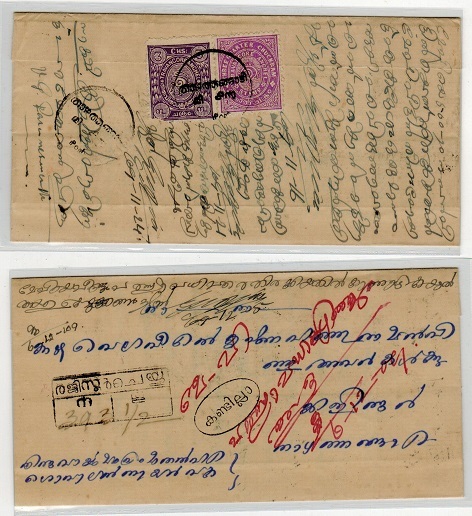 INDIA (Morvi State) - 1940 stampless official cover used locally at KHAT HALA. 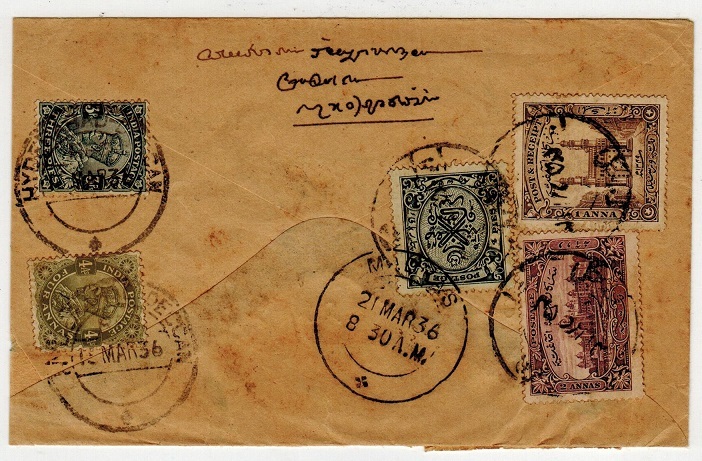 1940 use of stampless 'On Morvi State Service Only' official envelope addressed locally (small faults) cancelled by oval cog wheeled KHAT HALA cancel in violet. 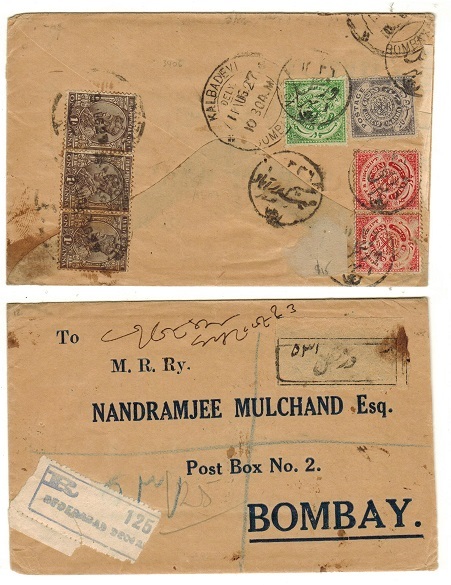 INDIA (HYDERABAD) - 1927 combination cover to Bombay. 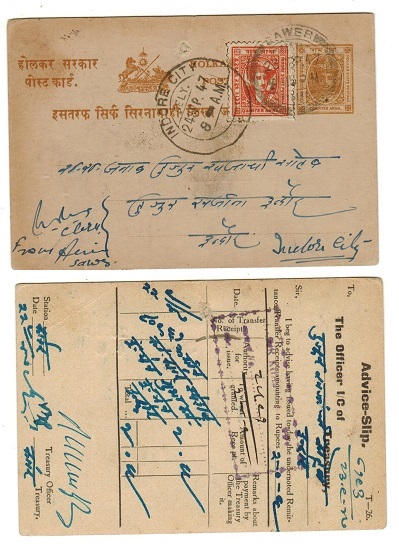 1927 registered commercial cover addressed to Bombay bearing 1/4a, 1/2a and 1a local pair tied by local cds in script and bearing additional Indian 'GV' 1a brown strip of three with KALBADEVI cds applied alongside dated 11.AUG.27. Complete with original contents. A scarce combination cover. 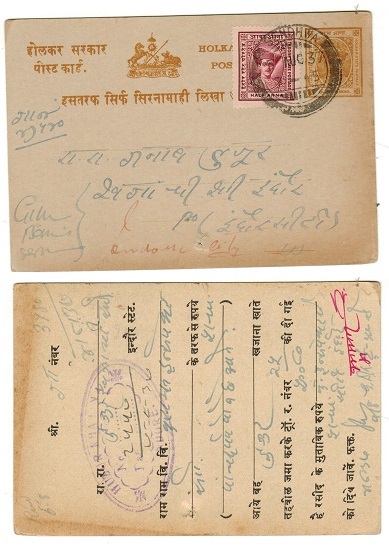 INDIA (Indore-Holkar State) - 1907 1/4a use of postcard (fold) used at RAMPURA. 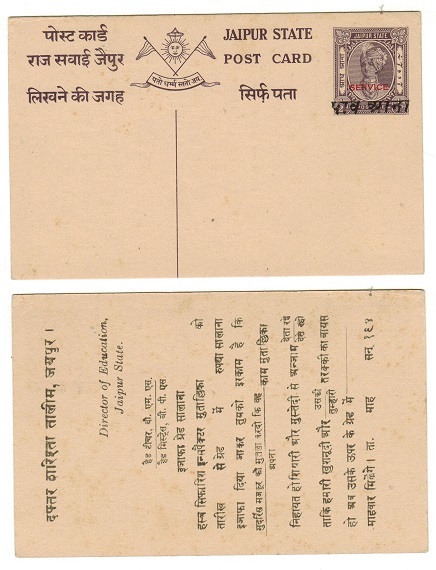 1907 postcard use addressed locally in local script (central fold) bearing 1/4a orange (oxidized) cancelled by RAMPURA cds dated 22.NO.07. A scarce use on cover. 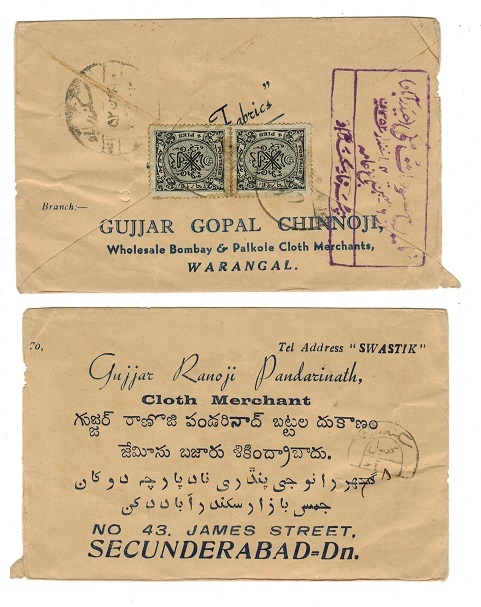 INDIA (Unkleshwar) - 1920 (circa) registered postal stationery wrapper unused. 1920 (circa) black on cream 'Registered' pre-paid postal stationery wrapper in fine condition pre-printed FROM NANDODE POST OFFICE/UNKLESHWAR at lower left. Unusual item. Unkleshwar is in the Bharuch district of the State Of Gujarat. INDIA (Hyderabad) - 1930 (circa) taxed stampless cover with EXPRESS DELIVERY h/s. 1930 (circa) stampless commercial cover addressed in native script (faults) with scarcer horse shoe 'tax' mark applied and with black boxed EXPRESS DELIVERY handstamp on reverse side. 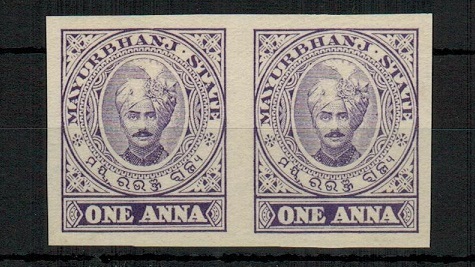 INDIA (Mayurbhanj State) - 1930 (circa) 1a purple IMPERFORATE PLATE PROOF pair. 1930 (circa) 1a purple 'Mayurbhaj State' revenue stamp IMPERFORATE PLATE PROOF pair. 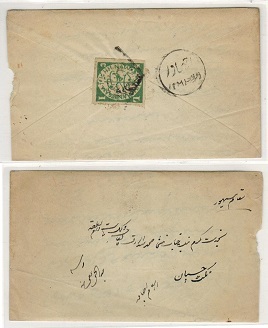 INDIA (Hyderabad) - 1947 (circa) 1 1/2a rate local cover to famous Muslim preacher. 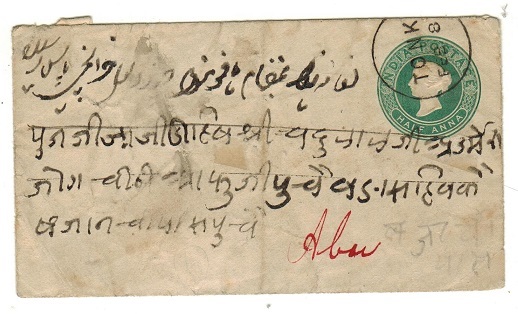 1947 (circa) cover addressed locally to 'Nawab Erach Yar Jung Bahadur' the famous religious preacher at Tarbund bearing 1/2a claret and 1a brown adhesives tied by local script cancel. INDIA (Kishangargh) - 1930 (circa) 4a chestnut on local court summons. 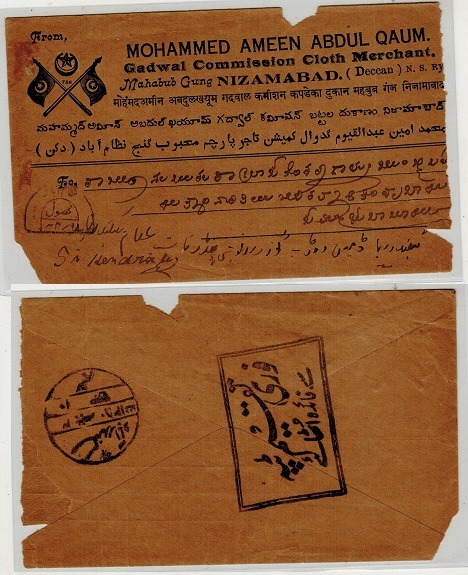 1930 (circa) use of folded court summons addressed locally in native script and bearing 4a chestnut adhesive on reverse side (SG type 16) tied by KISHANGARGH cds. 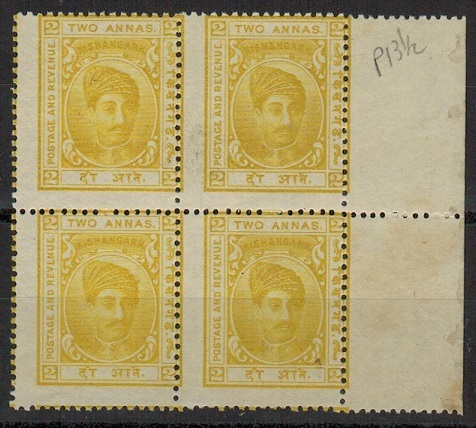 INDIA (Kishangarh) - 1907 2a orange yellow U/M block of four. SG 45a. 1907 2a orange-yellow adhesive in a fine unmounted mint right hand marginal block of four of the scarcer perf 13 1/2 issue. SG 45a. 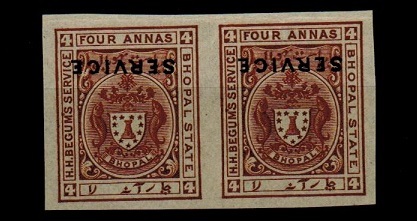 INDIA (Bhopal) - 1911 4a brown 'Service' IMPERFORATE block of four. SG 0308c. 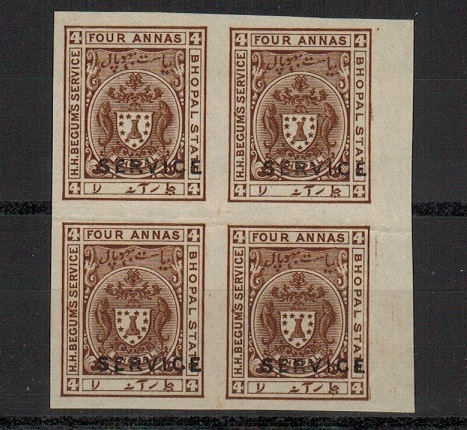 1911 4a brown 'SERVICE' adhesive IMPERFORATE block of four on ungummed paper. SG 0308c. INDIA (Bhopal) - 1911 4a brown 'SERVICE' IMPERFORATE pair with OVERPRINT DOUBLED. SG 0308bc. 1911 4a brown 'SERVICE' adhesive IMPERFORATE PAIR on ungummed paper but with major variety OVERPRINT DOUBLED. Unlisted as such in the imperforate form. SG 0308bc. INDIA (Bhopal) - 1911 4a brown 'SERVICE' IMPERFORATE pair with OVERPRINT INVERTED. SG 0308d. 1911 4a brown 'SERVICE' adhesive IMPERFORATE pair on gummed paper but with major variety OVERPRINT INVERTED. SG 0308d. INDIA (Bhopal) - 1911 4a brown 'SERVICE' U/M blkx4 with variety OVERPRINT INVERTED. SG 0308a. 1911 4a brown 'SERVICE' adhesive in a fine unmounted mint marginal block of four showing the variety OVERPRINT INVERTED. SG 0308a. INDIA (Bhopal) - 1908 2a ultramarine SERVICE U/M blkx4 with OVERPRINT INVERTED. SG 0307a. 1908 2a ultramarine SERVICE adhesive in a fine unmounted mint block of four with major variety OVERPRINT INVERTED. SG 0307a. 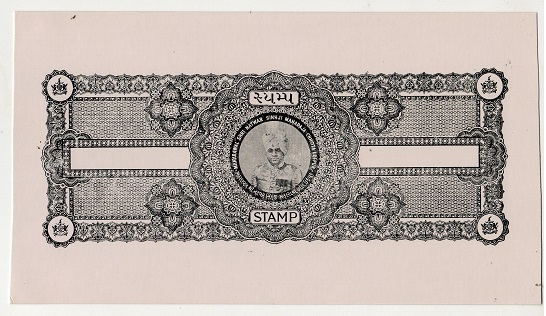 INDIA (Kalsia State) - 1948 1a IMPERFORATE COLOUR TRIAL of the REVENUE issue in deep plum. 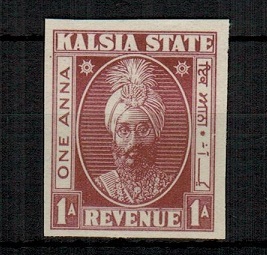 1948 1a IMPERFORATE COLOUR TRIAL printed in deep plum on gummed paper of the REVENUE issue depicting 'Roopinder Singh' the Raja of this state in the Punjab. INDIA (Kalsia State) - 1948 1a IMPERFORATE COLOUR TRIAL of the REVENUE issue in bright green. 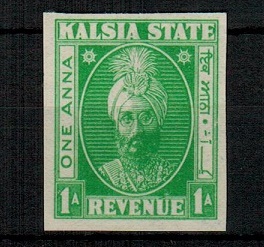 1948 1a IMPERFORATE COLOUR TRIAL printed in bright green on gummed paper of the REVENUE issue depicting 'Roopinder Singh' the Raja of this state in the Punjab. INDIA (Kalsia State) - 1948 1a IMPERFORATE COLOUR TRIAL of the REVENUE issue in dull red. 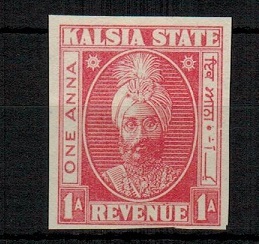 1948 1a IMPERFORATE COLOUR TRIAL printed in dull red on gummed paper of the REVENUE issue depicting 'Roopinder Singh' the Raja of this state in the Punjab. 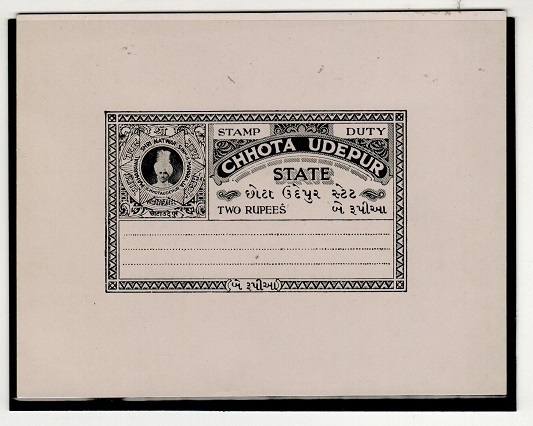 INDIA (Chhota Udepur State) - 1948 DIE PROOF in black of the court paper stamp duty issue. 1948 DIE PROOF printed in black of the 'Mahraja Maharawal Shri Natwar Sinhji' COURT PAPER STAMP DUTY issue on cream glazed card (222x124mm). Struck from the final plate without value showing head and shoulders in triangle overlayed by a further triangle to form a star. 1948 DIE PROOF printed in black of the 'Mahraja Maharawal Shri Natwar Sinhji' COURT PAPER STAMP DUTY issue on cream glazed card (222x124mm). Struck from the final plate without value showing head only. 1948 DIE PROOF printed in black of the 'Mahraja Maharawal Shri Natwar Sinhji' COURT PAPER STAMP DUTY issue on cream glazed card (222x124mm). Struck from the final plate without value showing head and torso. 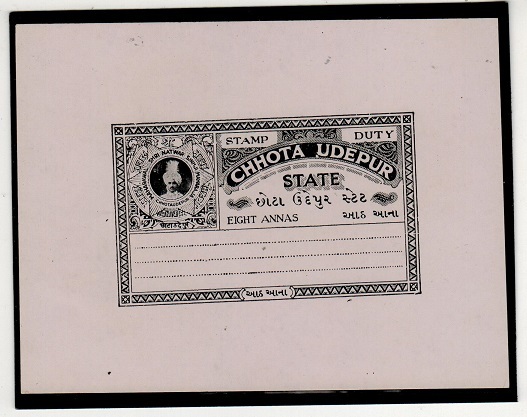 INDIA (Chhota Udepur State) - 1948 1a DIE PROOF of the STAMP DUTY issue in black. 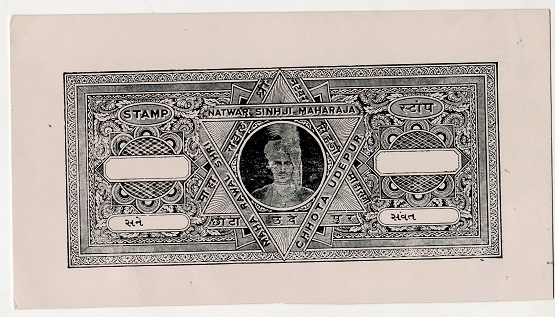 1948 1a DIE PROOF printed in black of the 'Mahraja Maharawal Shri Natwar Sinhji' STAMP DUTY issue on cream glazed card (75x83mm). Taken from the final plate but showing the 'Old Head'. INDIA (Chhota Udepur State) - 1948 1a DIE PROOF of the STAMP DUTY issue in block of four. 1948 1a DIE PROOF printed in black of the 'Mahraja Maharawal Shri Natwar Sinhji' STAMP DUTY issue on cream glazed card (104x131mm). Taken from the final plate and showing four impressions of the 'Young Head'. 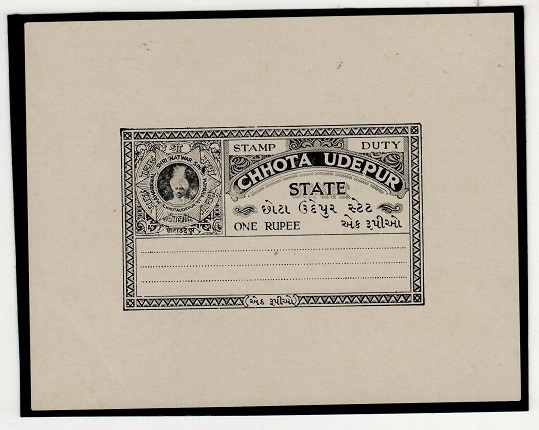 INDIA (Chhota Udepur State) - 1948 2r DIE PROOF in black of the stamp duty issue. 1948 2r DIE PROOF printed in black of the 'Mahraja Maharawal Shri Natwar Sinhji' STAMP DUTY issue on cream glazed card (137x105mm). Taken from the final plate. INDIA (Chhota Udepur State) - 1948 1r DIE PROOF in black of the stamp duty issue. 1948 1r DIE PROOF printed in black of the 'Mahraja Maharawal Shri Natwar Sinhji' STAMP DUTY issue on cream glazed card (137x105mm). Taken from the final plate. INDIA (Chhopta Udepur State) - 1948 8c DIE PROOF in black of the stamp duty issue. 1948 8c DIE PROOF printed in black of the 'Mahraja Maharawal Shri Natwar Sinhji' STAMP DUTY issue on cream glazed card (137x105mm). Taken from the final plate. INDIA (Bhor State) - 1899 1a deep red RECEIPT STAMP with INVERTED CENTRE. 1899 1a deep red RECEIPT STAMP (imperforate) tied to small piece by 'thumb print' cancel & showing the major variety KINGS HEAD IN CENTRE INVERTED. Listed by Koeppel & Manners. Exceedingly rare item. 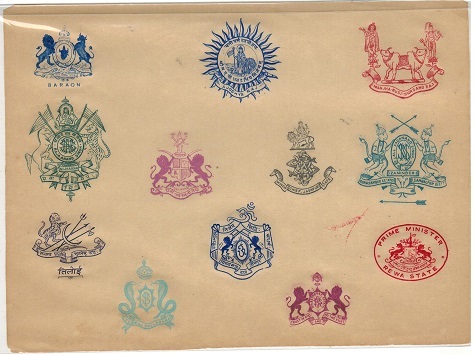 INDIA - 1920 (circa) range of 12 embossed crests of various states and departments applied on piece. 1920 (circa) cream paper pre-printed with 12 embossed crests of various states and departments in a range of beautiful colours. An unusual item from the printers showing their work ability. 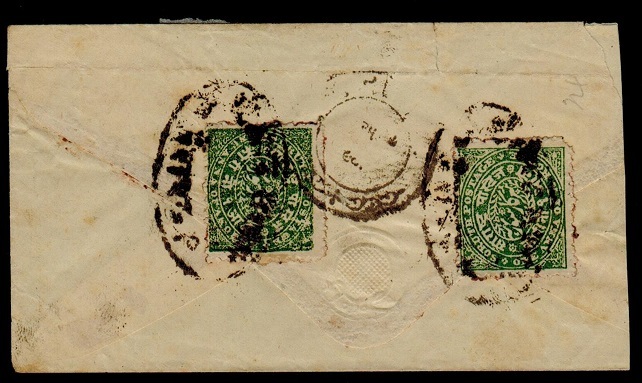 INDIA (Tonk State) - 1883 1/2a green PSE of India used locally at TONK. 1883 1/2a green on white postal stationery envelope of India addressed in local script & cancelled by single ringed TONK cds dated FEB.8.84. A little aged. INDIA (Jaipur) - 1947 1/4a on 1/2a dull violet PSC used locally. H&G 23. 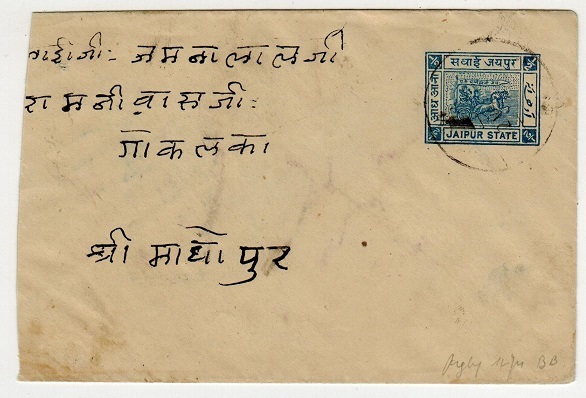 1947 1/4a on 1/2a dull violet on buff postal stationery postcard addressed in local script and cancelled by SAWA JAIPUR/Del cds dated 7.FEB.47. H&G 23. INDIA (Jaipur) - 1947 1/2a dull violet PSC unused overprinted SERVICE in red. 1947 1/2a dull violet on cream postal stationery postcard (H&G type 8) overprinted 1/4a in script in unused condition and additionally overprinted SERVICE in red. Unlisted by H&G as an official card with the reverse pre-printed for Director Of Education use. 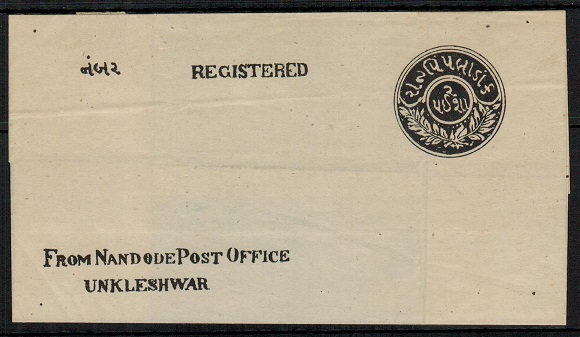 INDIA (Indore) - 1904 1/4a yellow brown PSC uprated locally at SENDWHE. H&G 4. 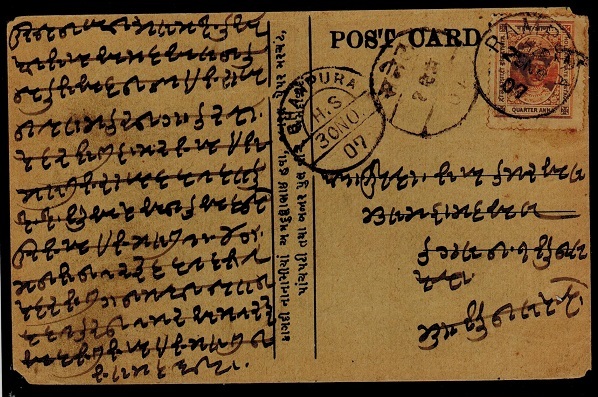 1904 1/4a Yellow-brown on buff postal stationery postcard with pre-printed reverse (punch hole) addressed locally & bearing an additional 1/2a adhesive (SG 17) tied SENDHWA & dated 5.AUG.37. H&G 4. INDIA (Indore) - 1894 1/2a violet brown PSE unused. H&G 1. 1894 1/2a violet-brown on cream postal stationery envelope in fine unused condition. H&G 1. INDIA (Hyderabad) - 1937 8p reddish brown PSC unused. 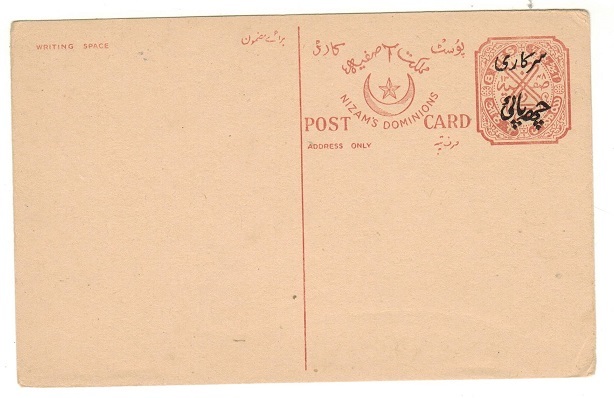 1937 8 pies reddish brown on cream postal stationery postcard pre-printed NIZAM'S DOMINIONS in unused condition (as per H&G 20) but officially overprinted SARKARI in Urdu. Unlisted by H&G. 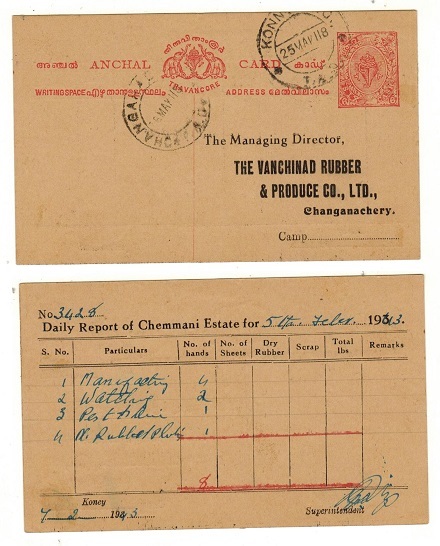 INDIA (Travancore-Cochin) - 1945 1ch claret PSE unused. H&G 14. 1945 1ch claret on buff embossed postal stationery envelope in fine unused condition. H&G 14. 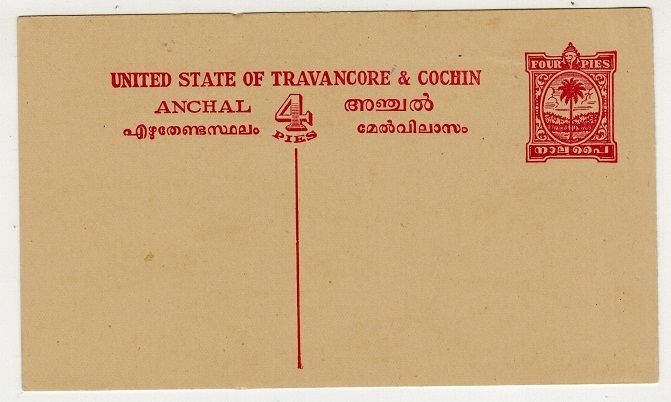 INDIA (Travancore-Cochin) - 1950 (circa) 1a claret PSE unused. 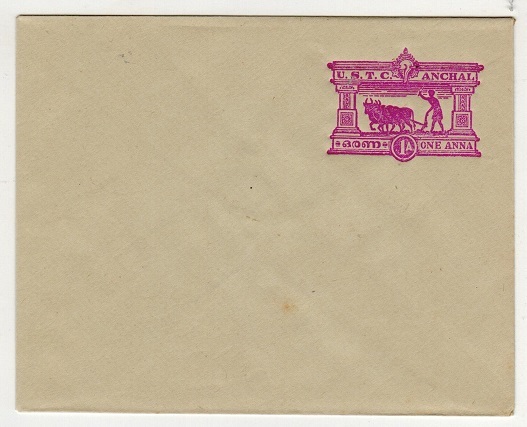 1950 (circa) 1a claret on cream postal stationery envelope in fine unused condition depicting farmer with cattle ploughing field and inscribed U.S.T.C. ANCHAL at top. Unlisted by H&G. 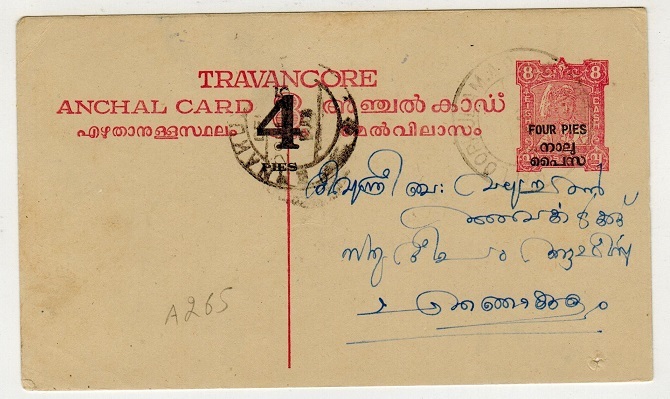 INDIA (Travancore-Cochin) - 1949 4p on 8c PSC used at BALLOORKULAM. H&G 2. 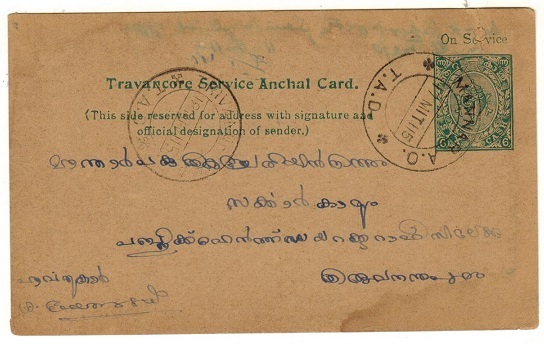 1949 4 pies black on 8c carmine on cream postal stationery postcard addressed in local script and cancelled by BALLOORKULAM. H&G 2. INDIA (Travancore-Cochin) - 1950 4p rose red PSC unused. H&G 3. 1950 4p rose-red on cream postal stationery postcard in fine unused condition. H&G 3. 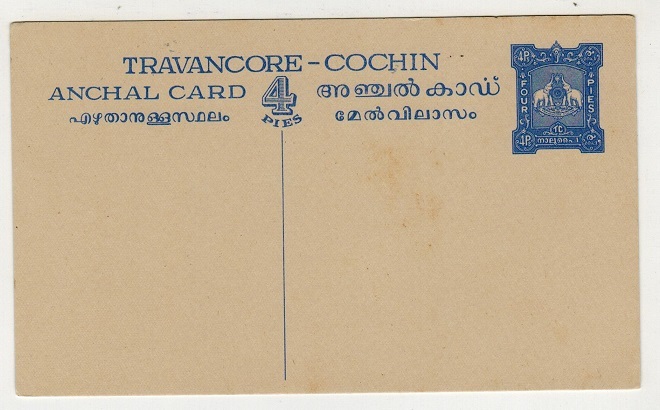 INDIA (Travancore-Cochin) - 1950 4p ultramarine PSC unused. H&G 4. 1950 4p ultramarine on cream postal stationery postcard in fine unused condition. H&G 4. INDIA (Hyderabad) - 1956 'Electrical Inspector' form bearing 4p and 1a official stamps used locally. 1956 letter from the Electrical Inspector to the Governemnt which has been folded and bearing official 4p black (SG 046) and 1a brown (SG 048) tied by local cancels. The 1a is noted to be a rare shade. INDIA (Hyderabad) - 1910 EXPERIMENTAL P.O.M343 postcard use from the 'Kapra Medical Camp' to UK. 1910 (JAN.27.) use of picture postcard addressed to UK depicting 'Chatter Mazab Palace at Lucknow' bearing Indian 1a adhesive tied by EXPERIMENTAL M343 cds and clearly marked at left by its origin at Kapra Camp. This being a medical camp for civilians. INDIA (Hyderabad) - 1905 8a IMPERFORATE COLOUR TRIAL trip of three in brown. 1905 8a (SG type 6) vertical IMPERFORATE colour trial strip of three in brown on ungummed paper. INDIA (Hyderabad) - 1905 1a IMPERFORATE COLOUR TRIAL pair in deep bottle green. 1905 1a (SG type 6) vertical IMPERFORATE colour trial pair in deep bottle green on ungummed paper. 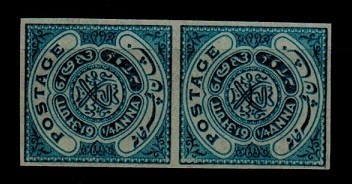 INDIA (Hyderabad) - 1905 1/4a IMPERFORATE COLOUR TRIAL pair in bright blue. 1905 1/4a (SG type 6) vertical IMPERFORATE colour trial pair in bright blue on ungummed paper. 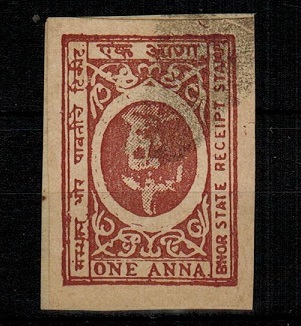 INDIA (Hyderabad) - 1891 1/4a brick red PSC used locally. H&G 2. 1891 1/4 anna brick red on cream postal stationery postcard of the second printing showing blurred impression addressed locally and cancelled by script 'moon' type cancel. H&G 2. 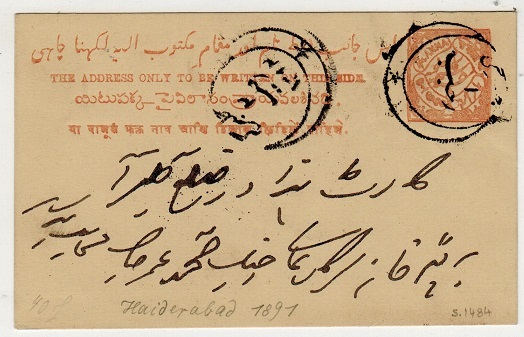 INDIA (Hyderabad) - 1891 1/2a yellow PSE used locally. H&G 10. 1891 1/2a yellow on cream postal stationery envelope addressed in local script and cancelled by s/r 'moon' crested local cancel. Slightly reduced at right from opening. H&G 10. 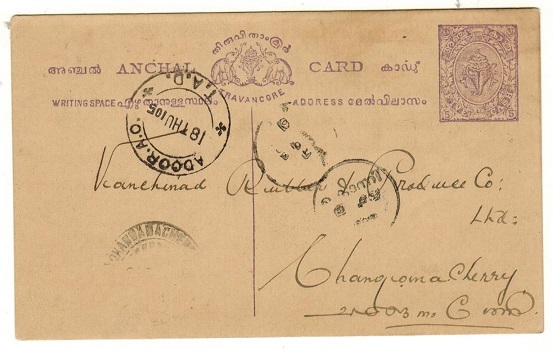 INDIA (Travancore) 1913 3/4a orange-red PSE registered locally and uprated. H&G 7. 1913 3/4a on cream postal stationery envelope registered addressed locally and bearing additional 4ca pink and 3ch violet (x5) adhesives on the reverse flap cancelled by local script cancels. H&G 7. INDIA (Soruth) - 1925 (circa) 3p rate cover tied SOURASHTRA POST. 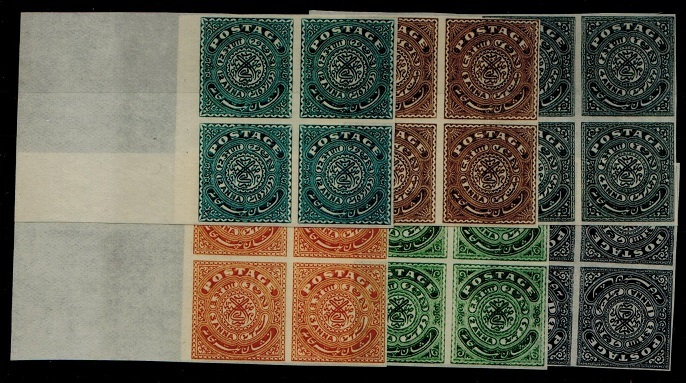 INDIA (Soruth) - 1876-86 1a green (x2) on local cover. 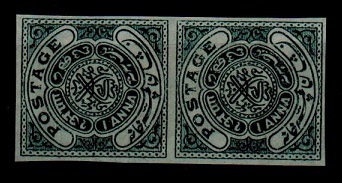 1876-86 1a green (x2) adhesives tied to the reverse side of local cover (slightly reduced from opening) by oval cancels with local strike alongside. INDIA (Kishangargh) - 1908 1/2a local wrapper use. 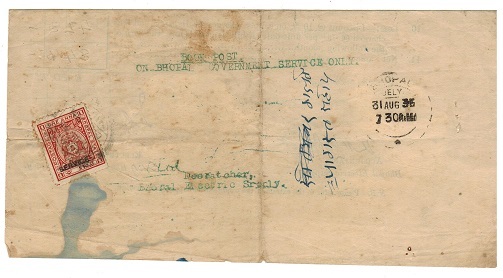 1908 use of local wrapper addressed locally in native script and roughly opened bearing a copy of the 1/2a greenish-blue adhesive (SG type 3) tied by KISHANGARGH cds dated 13.AU.08. A scarce stamp so used. INDIA (Bhopal) - 1890 (circa) 1/4a local cover. 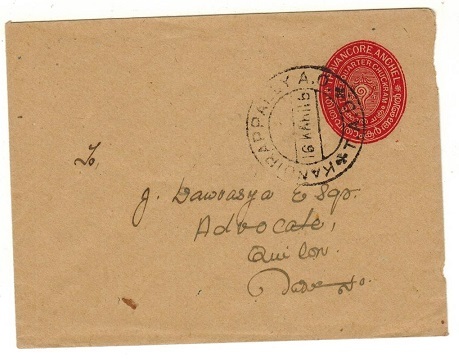 1890 (circa) local cover addressed in native script and complete with original letter bearing 1/4a deep green adhesive (SG type 15) tied to reverse flap. 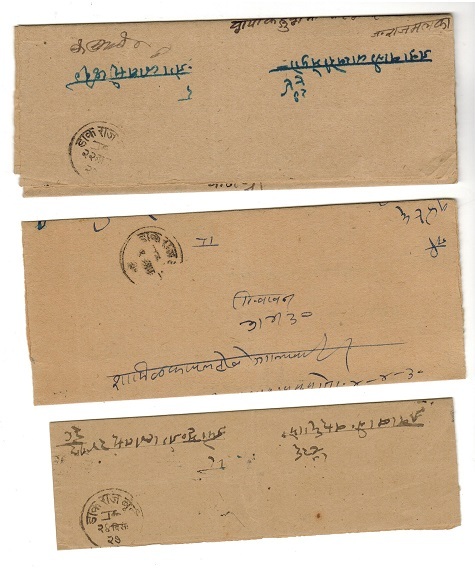 INDIA (Kishangargh) - 1949 use of 4a brown on court summons used at KISHANGARGH/RAJ.POST. 1949 (MY.11.) folded court summons bearing 4a brown adhesive tied KISHANGARGH/RAJ.POST cds. INDIA (Morvi) - 1934 6a dark green PSE used locally. H&G 5. 1934 6a dark green on cream postal stationery envelope with pointed flap addressed locally and cancelled by native script cancel. H&G 5. 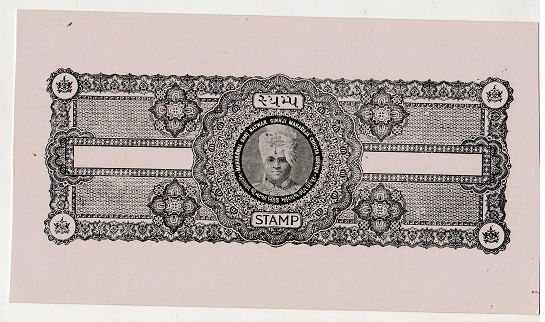 INDIA (Indore) - 1904 1/4a PSC used in combination with Indian 3p SERVICE stamp. 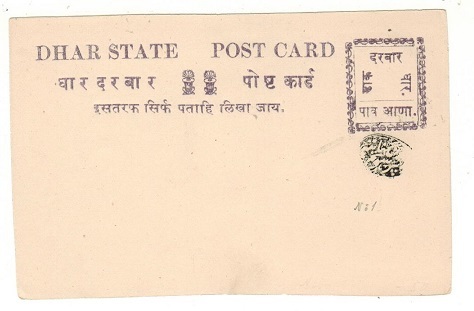 1904 1/4a yellow brown on buff postal stationery postcard of 'Holkar State' addressed locally and bearing additional Indian 3p grey 'Service' adhesive tied by KASRAWAY cds dated 4.AU.27. 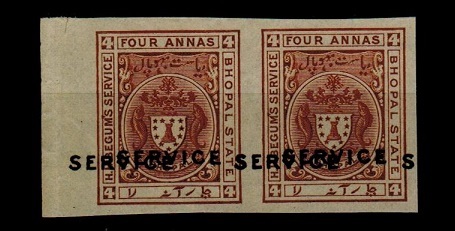 A scarcer combination use with this Indian service stamp. H&G 4a. 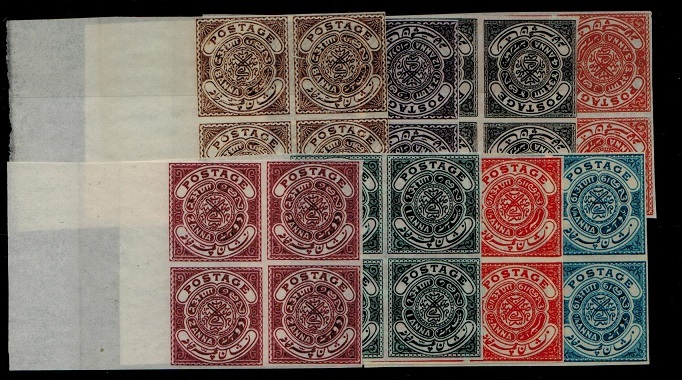 INDIA (Indore) - 1904 1/4a uprated PSC of 'Holkar State' used at GAWER. H&G 4a. 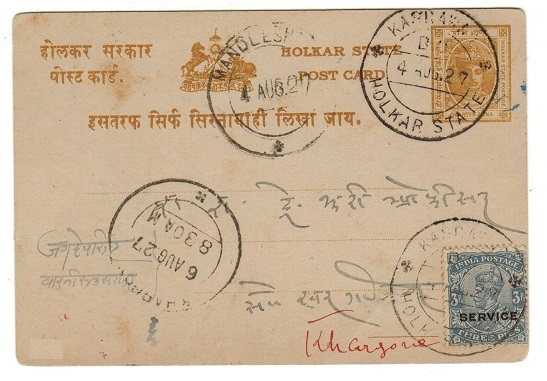 1904 1/4a yellow brown on buff postal stationery postcard of 'Holkar State' addressed locally and bearing additional 1/4a orange adhesive tied by GAWER cds dated 23.SP.47 with INDORE CITY arrival cds at left. The reverse of the card is pre-printed for 'Treasury-Advice Slip'. H&G 4a. INDIA (Hyderabad) - 1945 1a blue 'Victory' adhesive cover with scarce POSTAGE DUE h/s. 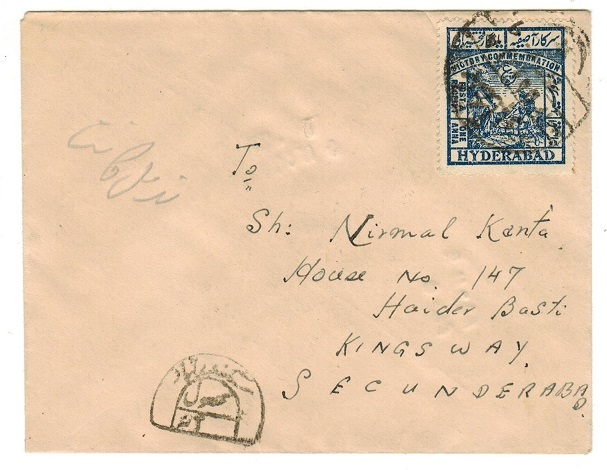 1945 cover addressed to Secunderabad bearing the 1a blue 'Victory' adhesive (SG 23) tied by local cds in script and with scarce horse shoe type POSTAGE DUE h/s applied at lower left. 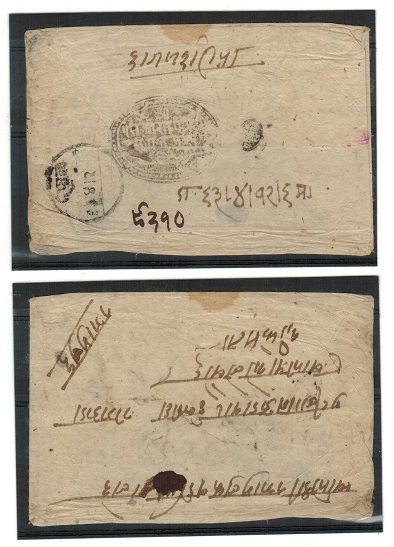 INDIA (Hyderabad) - 1930 registered combination cover. 1930 (JUN.6.) 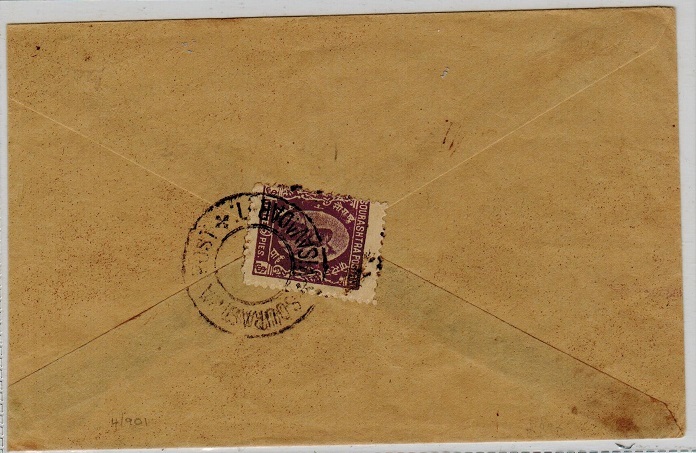 registered cover addressed to Bombay (complete with original letter) bearing Indian 1a brown block of four on reverse flap tied with Hyderabad 1/4a (x3) and 1/2a (x3) adhesives (SG 39+40) by HYDERABAD-DECCA cds's and local cancels. A scarce combination cover. 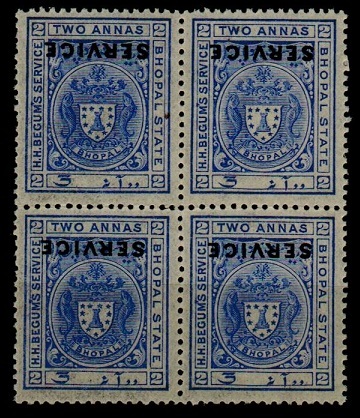 INDIA (Jaipur) - 1934 1/2a blue PSE used locally. H&G 5. 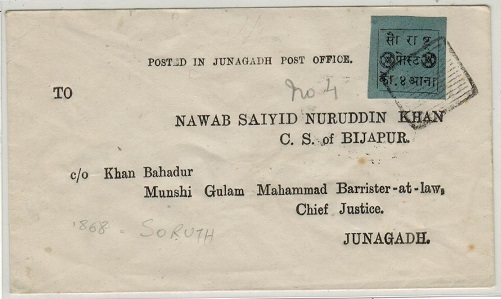 1934 1/2a blue on cream postal stationery envelope (reduced at left from opening) addressed locally and cancelled by indistinct cancel but with SRI MADHDAUR arrival b/s dated 13.MAR.39. Complete with original contents. H&G 5. INDIA (Jaipur) - 1934 1/4a violet PSC used at PHALERA. H&G 14. 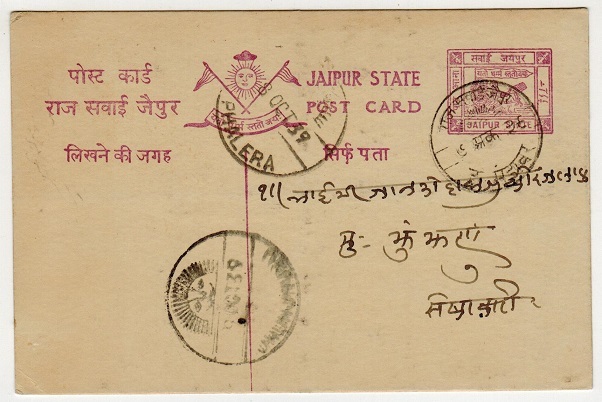 1934 1/4a violet on buff postal stationery postcard addressed in local script and cancelled by local cancel with PHALERA cds at left dated 8.OC.39 and with crested face type JAIPUR below dated the following day. H&G 14. 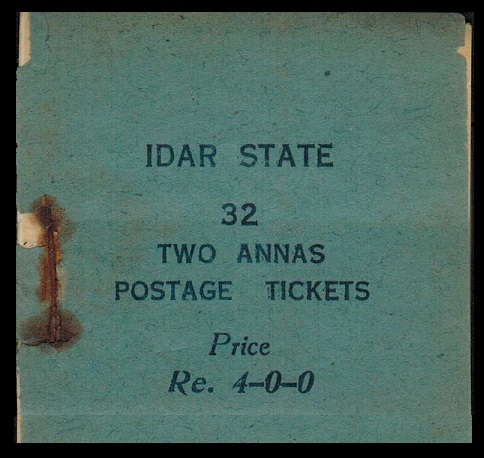 INDIA (Idar State) - 1944 Re4-0-0 dark blue complete BOOKLET. 1944 Re4-0-0 dark blue on blue complete BOOKLET containing eight panes of four (32 stamps) of the 2a blue adhesive (SG 5). The staple is rusted and the front cover has come away but is complete. Scarce item. 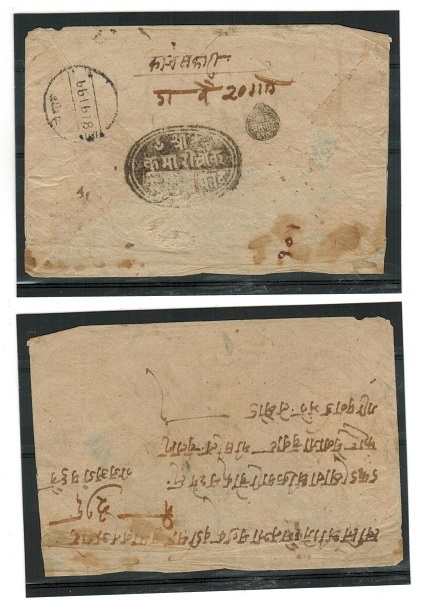 INDIA (Bhopal) - 1936 official folded paper used locally with 1a SERVICE stamp at BHOPAL. 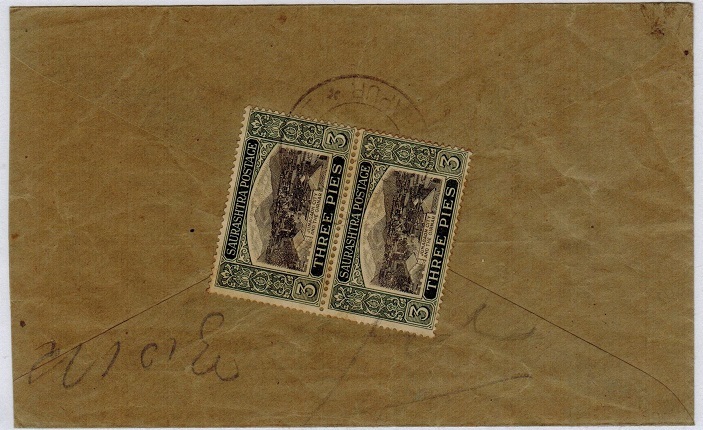 1936 official folded paper addressed locally and marked 'PER BOOK POST/ON BHOPAL GOVERNMENT SERVICE ONLY' bearing1a carmine red adhesive overprinted SERVICE (SG 0310) and tied by BHOPAL cds dated 31.AUG.36. Faults but a scarce stamp on cover. 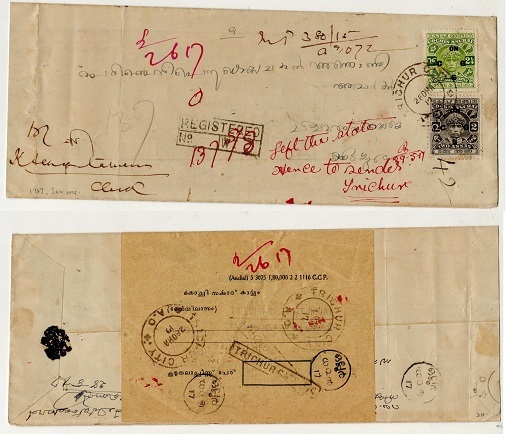 INDIA (Hyderabad) - 1940 (circa) underpaid cover with 'Postage Due' h/s. 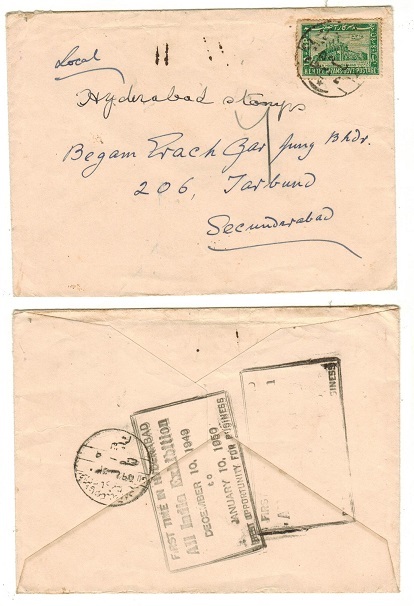 1940 (circa) commercial pre-printed cover addressed locally to Secunderabad bearing 4p black adhesive pair on reverse flap (SG 41) tied by script cancel and struck by violet boxed TO POPULARISE STATE INDUSTRY handstamp applied to covers between 1940 and 1950. The cover was underpaid and has 'horse shoe' type POSTAGE DUE h/s applied on arrival. INDIA (Hyderabad) - 1940 H.E.H NIZAM SERVICE 'Economy' label used. 1940's circa H.E.H. 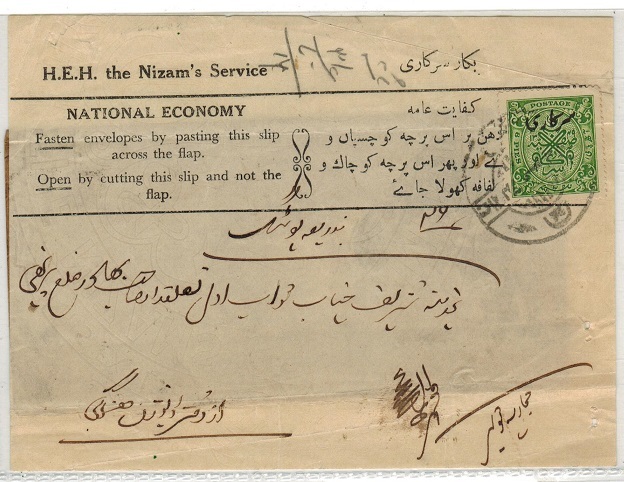 THE NIZAMS SERVICE national economy label addressed in local script and attached to part manilla wrapper bearing official 8p green adhesive (SG 047) and cancelled by local cancel. These labels were issued during the 2nd World War by the Government due to the lack of paper so envelopes could be re-used. INDIA (Hyderabad) - 1931 local underpaid card with POSTAGE DUE mark. 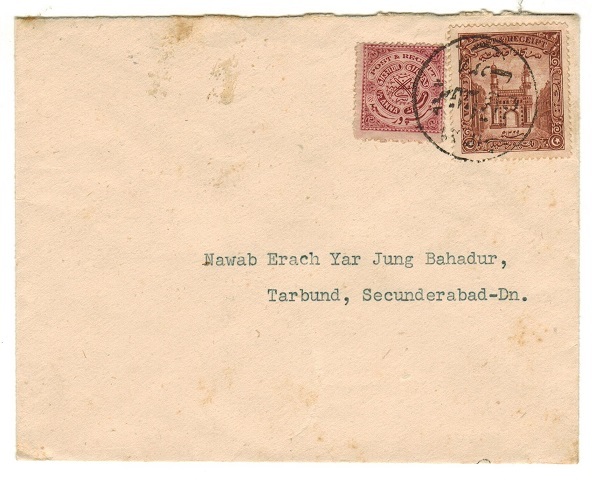 HYDERABAD - 1931 use of locally pre-printed blank type postcard but with local script pre-printed reverse in red bearing 4p black adhesive (SG 41) and tied by Manwat cancel. The card has a manilla strip added with additional cancels and being under-paid having half moon 'Postage Due' handstamp added for 1a4ps following the increase in the postal rate in 1930 from 1/2a to 8pies. This being the double rate 1a4p. Nice due marking. INDIA (Travancore) - 1949 HALF PENNY on 1ch PSE uprated with additional 1/2a used at KALLOPARA. 1949 HALF ANNA black on 1ch claret on buff postal stationery envelope addressed locally bearing additional 1/2a on 1ch green adhesive tied by d/r KALLOPARA A.O. cds. H&G 1. INDIA (Travancore) - 1934 local registered entire with scarce NOT FOUND handstamp applied. 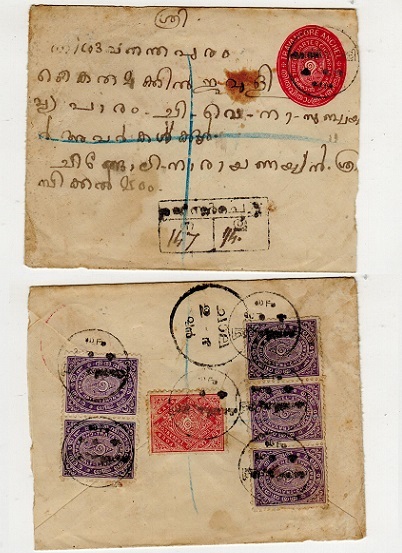 1934 registered entire addressed to Thazhathangadi bearing 3/4ch (SG 39) and 3ch (SG 44)on reverse cancelled in native script at Thiruvarppu. Boxed REGISTERED handstamp on front (No.393/Wt 1/2' and with scarce native script oval NOT FOUND instructional h/s applied. INDIA (Hyderabad) - 1936 registered COMBINATION cover to Madras from HYDERABAD-DECCAN. 1936 (MAR.15.) 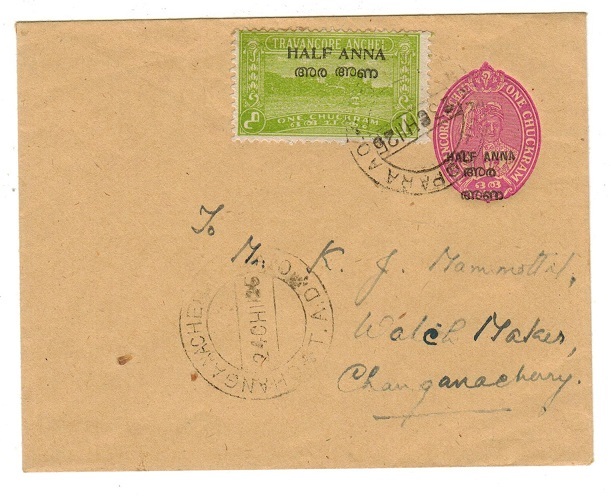 registered cover addressed to Madras bearing Indian 3p and 4a adhesives tied HYDERABAD-DECCAN tied in combination with local Feudatory Hyderabad 4p, 1a and 2a adhesives (SG 41,43 and 44) tied by local cancels. A scarce combination cover. 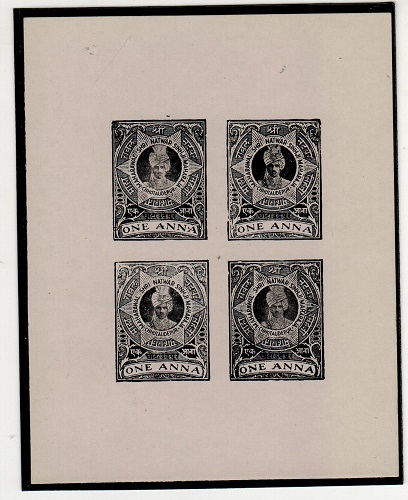 INDIA (Hyderabad) - 1905 'Postage' IMPERFORATE PLATE PROOF blocks of four. 1905 'Postage' (SG type 6-with clear background) IMPERFORATE PLATE PROOF marginal blocks of four in the following colours. 1/4a blue, 1/2a red-orange, 1a slate, 2a deep plum, 3a orange 4a black, 8a brown and 12a purple. 8 blocks. 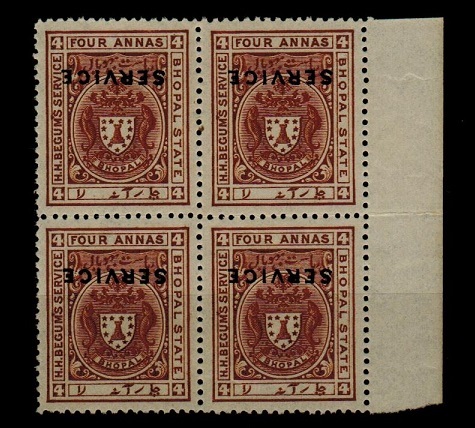 1905 'Postage' (SG type 6 but with dark background) IMPERFORATE PLATE PROOF marginal blocks of four in the following colours. 1a black, 2a green, 3a ochre, 4a slate, 8a brown and 12a grey-blue. Unissued in this type with dark background. 6 blocks. 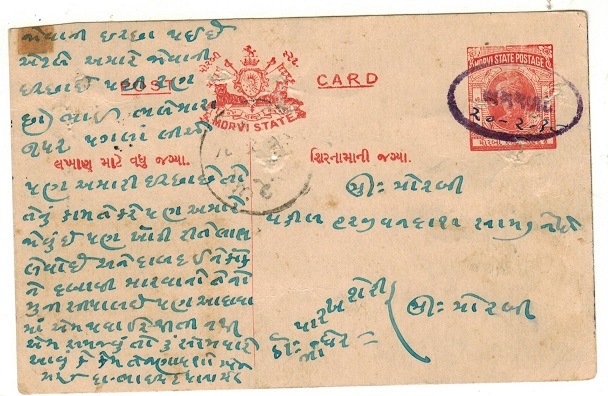 INDIA (Soruth) - 1946 local cover bearing 1a tied SAURASHTRA POST/VERAVAL. 1946 (JLY.26.) 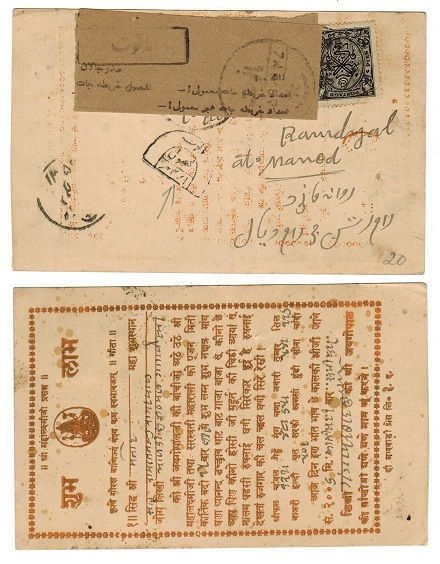 cover addressedlocally in Hindi bearing 1a (SG 51) tied by SAURASHTRA POST/ VERAVAL cds. Scarce on cover. 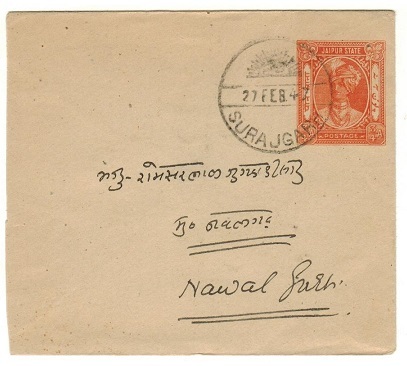 INDIA (Soruth) - 1940 local cover used at SAURASHTRA POST. 1940 (APR.28.) 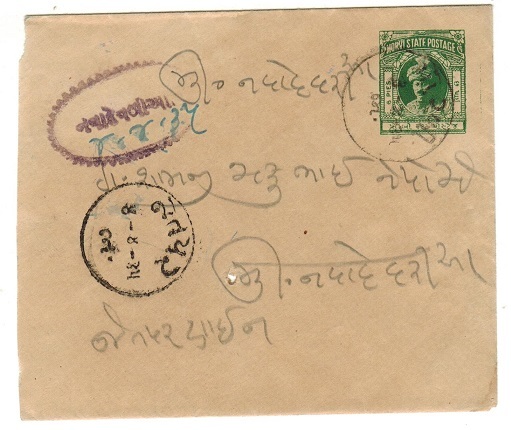 cover addressed locally in Hindi bearing 3p adhesive pair (SG 49) tied by SAURASHTRA POST cds. Scarce on cover. INDIA (Travancore) - 1949 HALF ANNA on 1ch PSE used at KALLPOARA. H&G 1. INDIA (Travancore) - 1949 four pies on 8c rose red PSC used locally from CHANGANACHERRY. H&G 2. 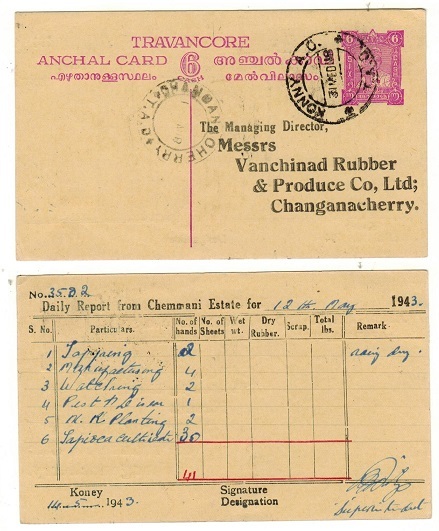 1949 FOUR PIES black on 8c rose red on cream postal stationery postcard addressed in local script and cancelled by d/r CHANGANACHERRY A.O./T.A.D. cds. H&G 2. INDIA FEUDATORY STATES - 1900 local cover with hand stamp seal cancel. 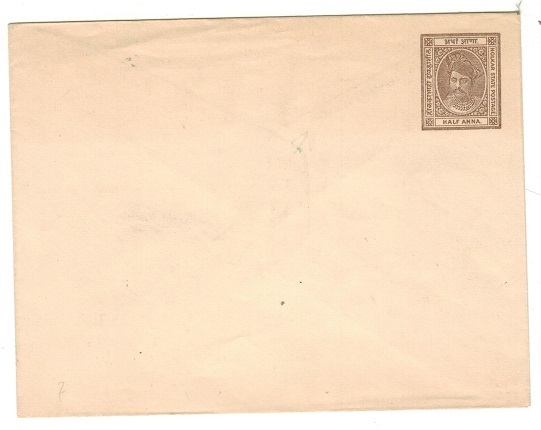 1900 (circa) stampless envelope addressed locally in script struck on the reverse side by oval handstamp seal in black ink used by miscellaneous offices and estates at this time. INDIA (Bundi) - 1927/30 range of three papers each cancelled by BUNDI cancels. 1927-30 range of three papers all in local script and each cancelled by BUNDI cds's. (3 items).